The vestibular system is one of the key elements in how the body balances itself. When something is wrong with this system, the results can be vertigo, loss of balance, and even a fall that could lead to serious injury. 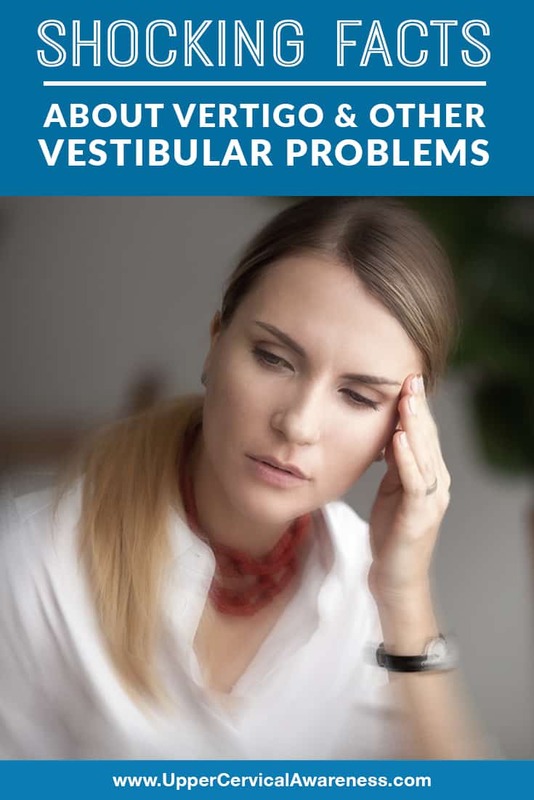 How common are vestibular problems such as vertigo? What are the underlying conditions that cause vertigo? Is there any way to find natural relief? Here are some shocking facts related to vertigo. Once a person hits 40, the risk of developing a vestibular problem increases exponentially. In fact, between 30 and 40% of people age 40 and over will experience vertigo. But don’t let this statistic fool you. Age alone is not the cause of vertigo. There are a number of misconceptions about vertigo. One is that it is related to a fear of heights. However, vertigo, in reality, is a false sensation of movement. This also dispels the idea that vertigo is always a feeling that the room is spinning. While that is definitely a false sensation of movement, the room may also seem to tilt or sway. Any false sensation of movement can be categorized as vertigo. In fact, it isn’t always the room around you that feels like it is moving. To prove that point, the next time you experience vertigo, find a safe place to lay down and close your eyes. Now you may feel like you are moving instead of the room (note: this may not happen with a mild case of vertigo). There are many vestibular conditions that can cause vertigo. Benign paroxysmal positional vertigo (BPPV) is considered to be vestibular (although the actual cause is only determined in about half of cases). Vestibular neuritis, labyrinthitis, and Meniere’s disease are a few other possible causes. However, vertigo can also be caused in the central nervous system (CNS). Examples include migraines, MS, stroke, and vertigo that is associated with cervical disease. In fact, head or neck trauma are common precursors to the onset of recurrent vertigo. You often hear people speaking about vertigo as if it was a disease itself. Perhaps this is because only about half of people who get vertigo will ever find the actual cause. However, vertigo is a just a symptom. If you are diagnosed with idiopathic BPPV, that just means your doctor doesn’t know what is causing the vertigo and is using positional vertigo as a catch-all. Vertigo is a difficult condition to explain to someone who has never experienced it. There are no visible symptoms unless it is bad enough to cause a fall (called a drop attack), or if you get nauseous and begin to vomit due to motion sickness (which can happen when vertigo is severe). Therefore, the friend you are canceling plans with or your boss when you are calling in sick may be reluctant to believe you are not feeling well. You may get accused of faking or being lazy. However, it is best not to push yourself if you are experiencing severe vertigo. A fall can cause some serious damage or even death, and you certainly don’t want vertigo to strike while you are driving. We mentioned earlier that vertigo is sometimes mistaken for a normal part of the aging process. Well, so is a loss of cognitive function such as memory issues or difficulty focusing. However, these may actually be related symptoms rather than just two different effects of aging. Many of the conditions that cause vertigo can also lead to issues with thinking, focus, and remembering things. There are plenty of pills that a doctor may prescribe for vertigo. However, these are all just treating the symptom of vertigo rather than correcting the underlying condition that is leading to the problem. The main issue with vertigo treatment is that the underlying cause of vertigo is unknown. There are a number of conditions that have vertigo as a symptom, but even in these cases, it is not always understood why the condition causes vertigo. However, there may be a frequently overlooked issue that is related to vertigo and many of the conditions that cause it. When the atlas is misaligned, it can reduce how much blood is reaching the ears and the brain. The brainstem can be placed under pressure since the atlas surrounds it. A misalignment may also affect the Eustachian tubes, which are supposed to drain excess fluid away from the ears. Excess fluid can certainly lead to vertigo as well as hearing problems, and ringing in the ears (tinnitus). So if you are suffering from vertigo or other vestibular symptoms, it makes sense to have your atlas checked by an upper cervical chiropractor. If it is out of alignment, a safe and gentle adjustment may be able to correct the underlying issue that is resulting in many of your symptoms. It is no wonder that in one case study of 60 patients with vertigo that 80% were vertigo-free after having an atlas misalignment corrected. If you are interested in learning more about what upper cervical chiropractic may be able to do to benefit you, contact a practice in your area to schedule a consult today.